Wales fly-half Rhys Priestland has reversed his decision to take an 18-month break from international rugby. Bath boss Mike Ford announced in October that the former Scarlet star, 28, was taking a sabbatical. "We agreed to sign Rhys on the basis that he did not play international rugby," said Ford. "He's now decided that he wants to play again." Dan Biggar was the first choice No 10 during the World Cup earlier this year as Wales reached the quarter-finals. Priestland has won 40 Test caps and replaced Biggar during the last-eight loss to South Africa on 17 October. Ford explained that Priestland's U-turn was the reason Bath had signed utility back Dan Bowden from New Zealand. But the coach added: "We're hoping Rhys will be with us for the two years of his contract and possibly beyond that." 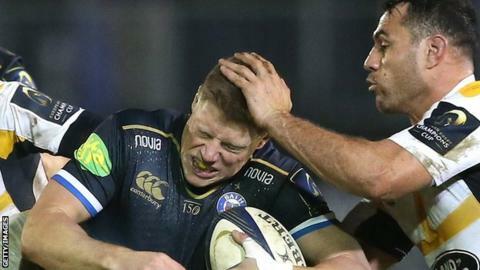 Ford wanted Priestland to act as cover for his son, George, who is expected to be part of England's Six Nations squad.